- A Deluxe Carbine Case that is fully padded for the safe transporting of 2 carbines and all of your other essential shooting gear. - This Deluxe Case includes many different zippered compartments and pouches to keep your shooting gear organized and easy to get to. - The main compartment has Heavy Duty zippers with metal zipper pulls that can be locked with a small pad lock (lock not included). - The Deluxe Carbine Case has diagonal pockets on each end to help secure the stock and muzzle end of the carbine and a 2 hook and loop straps to secure each of the carbines. - The secondary compartment is loaded with two zippered compartments and two padded compartments with hook and loop fasteners to store extra shooting gear such as: handguns, optics, cleaning supplies, log books, etc. - The three exterior pockets have flaps that close via hook and loop fasteners and plastic quick connect buckles to keep your gear secure. - Each of the three pockets have bungee cording that can be adjusted to the size of your gear. - The three exterior pockets are perfect for keeping your hearing and eye protection, magazines, magazine loaders, and ammo organized. - The exterior of the Deluxe carbine case includes two zipper compartments along each side of the secondary compartments with MOLLE webbing for attaching other MOLLE compatible gear to the outside of the case. 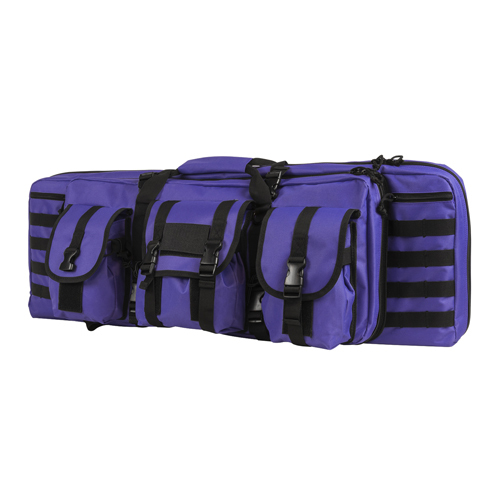 - There are two top compression straps and two bottom compression straps with plastic quick connect buckles to keep your gear in place and to prevent them from shifting inside the case. - Heavy Duty carry handle straps and padded Backpack straps to help carry your gear where you need to go. - The fully adjustable padded backpack straps are wide to distribute the weight onto your shoulders, a sternum strap with a plastic quick connect buckle, and metal D-Rings. - There is also a 3.5" X 2" hook and loop fastener for name/ID patches and moral patches, sewn onto the center pouch flap. - 36" Double Carbine Case is constructed of heavy duty PVC material and the main compartment is fully padded on all side with thick �" closed cell foam padding. - The main compartment will accommodate two carbines with an overall length of 35" inches or less.